I previously wrote about how much my favourite crime books encouraged me to visit Norway and Sweden, and my favourite movies are no different. In fact, some of my favourite movies are not so much cherished because of the story, but entirely down to where they’re set. They have little soaps in the shape of swans…could you die? My favourite movie ever starts in some backwater in the south and moves on to the glamorous and sophisticated Manhattan, where we follow the stories of two sets of identical twins who were mixed up at birth. When I first visited New York, I had to see it for myself. I ended up in The Plaza for a rather expensive Caesar Salad and a bottle of beer. Seriously: it was extortionate but SO worth it. However, it’s a memory I’ll remember forever as I spent much of my time in the hotel lobby and restaurant, pretending I was Bette Midler, flouncing around, reciting lines from the movie and trying to buy polka dot dresses. The Plaza is an iconic New York building, located on the corner of Central Park South on Fifth Avenue. If you haven’t seen it, or Big Business, you are NOT living your best life. No one really minded that gun company losing their money, anyway. I love this movie. I love John Cusack IN this movie. I love John Cusack in any movie, tbh, but that’s hardly the point I’m trying to make. The movie adaptation of the fabulous John Grisham legal thriller is set in New Orleans and the location is what keeps me coming back to watch it time after time. From the first morning, we see JC being monitored on his way down the street, stopping for takeout coffee and a beignet, I knew I had to visit. Fast forward about 15 years and boom, I was right there. From wandering along endlessly beautiful streets with their fabulous facades, front porches, the wonderful independent stores and the grand old city squares, all captured in the afternoon sunshine, it’s impossible not to love NOLA. The fact that you can also totally get a jury verdict to go the way you want it while annoying the life out of Gene Hackman just makes it all the more attractive, right? Miami has plenty of dark, secluded posts to carry out your ‘business’. Also: beautiful buildings and friendly natives. Between the sultry heat, the art deco buildings of South Beach, and the presence of so many massive drug deals, Miami is a must-see destination. I jest, of course, drug deals are bad, folks. 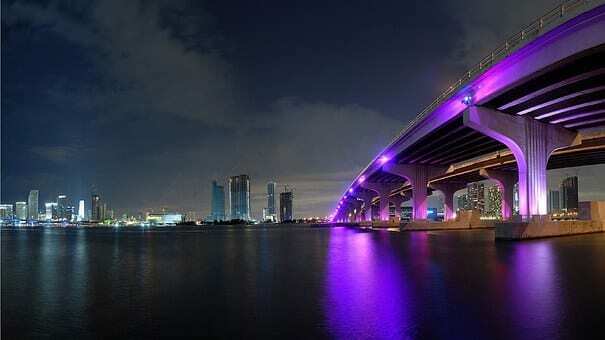 It’s the party atmosphere and heritage that makes Miami a stand out place. It’s a real melting pot of American, Cuban, Jewish, and many other cultures and traditions. There are so many experiences to be had from all over the globe. Bad Boys was the movie that showed me the city streets and the fabulous Biltmore Hotel, whichTea Leoni casually jumps off the top of in order to get away from bad men wielding guns. Well, you would, wouldn’t you? Probably don’t try that if you go, though. Chances are you won’t fare quite as well as she did. The Biltmore is located in the Coral Gables area of the city and is a designated historic landmark. The architecture is outstanding and is of beautiful Spanish Revival design. It just fits in completely with the surrounds and towers majestically over the street. Who doesn’t want to hide out here? This is the movie that made me want to bust out of jail, go on the run and be hunted down by Tommy Lee Jones for a crime I didn’t commit. I mean, I don’t even HAVE a wife, so it’s clearly all been a mix-up. Chicago looks great throughout the film, with scenes shot from the air over the massive city skyline to demonstrate just how easy it is to get lost in the streets. Also: some totally dodgy neighbourhoods and the meanest one-armed man since Abu Hamza. Don’t let that detract from the city, though. From taking a ride on the El, breaking into Cook Country Hospital to clean the blinds in the prosthetic department, to running through a group of pigeons on Daley Plaza Picasso: Chicago has it all. Who doesn’t dream of doing these things on holiday? I know I do. Just be sure to avoid jumping off that waterfall, won’t you? Thanks. Have any of your favourite movies inspired your road trips across the US?